The coolest things are the Petri dishes. The Petri dishes constitute the 'river': Each dish is one area where players' canoes can be. At the end of each turn, the 'river' advances: New dishes arrive upstream and push the old dishes (and the canoes on them) towards the fall. Due to an ingenious mechanism the dishes fall alternating from the left and the right fall. This game offers fun and some challenge for seasoned players, and it can still be explained to beginners with no trouble. Gameplay is very quick since you cannot forfeit your moving allowance. 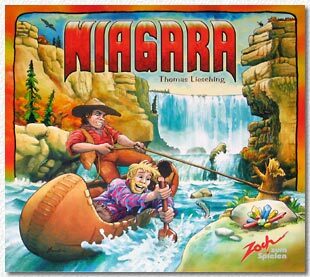 And the haptic/optic impression of Niagara is excellent. Niagara can be recommended wholeheartedly to anyone.